Schöner Valentinstag! 🙂 Für die heutige Maniküre habe auf Mittel- und Zeigefinger 3 Schichten SuperChic Lacquer Ice Rageous aufgetragen und die grünen Herzen von Born Pretty Store in den noch feuchten Lack gesetzt. Auf Ringfinger und kleinen Finger habe ich 3 Schichten KBShimmer Merry Pinkmas und 1 Schicht Essie As Gold As It Gets aufgetragen. Happy Valentine’s Day everyone! 🙂 For today’s manicure I applied 3 coats of SuperChic Lacquer Ice Rageous on index and middle finger and added green heart shaped studs from Born Pretty Store. On ring and pinkie I applied 3 coats of KBShimmer Merry Pinkmas and 1 coat of Essie As Gold As It Gets. 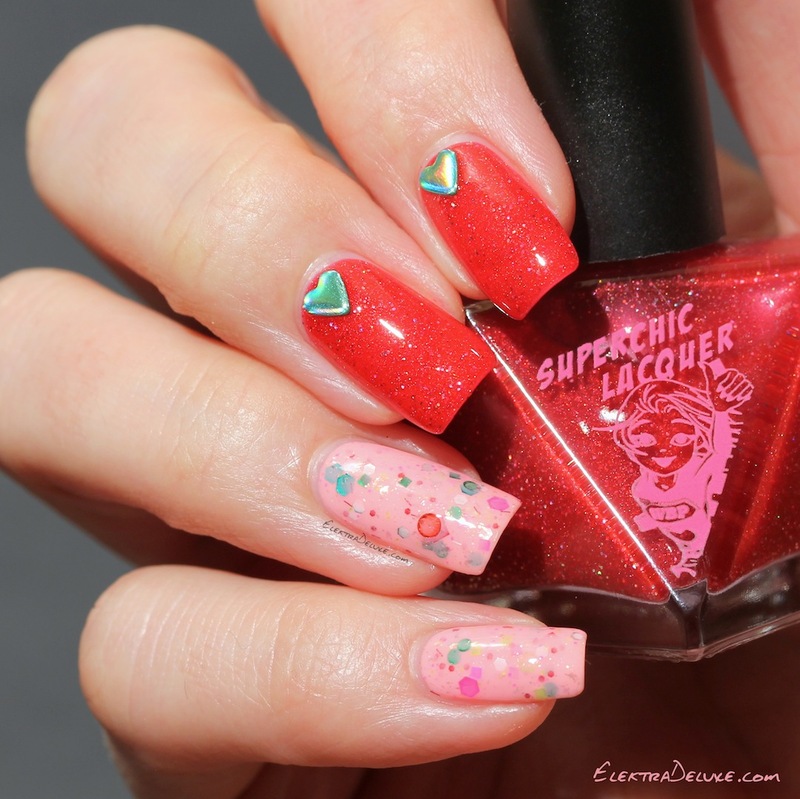 SuperChic Lacquer Ice Rageous ist ein leuchtend roter Jelly-Lack mit Schimmer und einem tollen Mix an glitzernden Holo-Partikeln. Ich habe wirklich viele rote Lacke in meiner Sammlung, aber dieser sticht hervor! Der Lack gehört zur aktuellen SuperChic Lacquer Winter Collection ‘Frozen & Flurrious’. SuperChic Lacquer Ice Rageous is a gorgeous vibrant red jelly base with shimmer and icy multi-faceted scattered holographic effects. I already own so many reds but this one clearly stands out! The polish belongs to the current SuperChic Lacquer Winter Collection ‘Frozen & Flurrious’.